A proposed merger between two European research associations, which would create a slimmed down organisation and present a united front for European science, has failed to secure the agreement of enough of its members to proceed. The vote to establish a new organisation that would encompass the European Heads of Research Councils (EUROHORCs) and the European Science Foundation (ESF) fell short by two votes at the deciding meeting on 4 May. EUROHORCs and the ESF have similar aims as they both represent the interests of research and contribute to European research policy. However, many academic institutions and policy makers alike are confused as to why there are two competing organisations striving for the same goal. 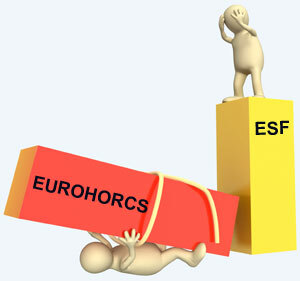 Almost all the members of EUROHORCs, as the heads of research councils, are also members of the ESF. The two organisations have identified synergies and have been working together to formulate policy for the European Research Area Roadmap and over recent years have been looking to merge into a single organisation. In addition to overlapping missions and membership, EUROHORCs are desperate for a full secretariat to do the leg work on policy development, while the ESF are keen to have a more unified voice to influence decision makers in Europe. EUROHORCs passed the merger motion at its general assembly with a large majority. However, at the ESF the motion failed to receive the two-thirds majority required by ESF statutes. While the ESF are keen to form a new organisation with EUROHORCs, its members recognise that there are disadvantages too and these may have driven the vote against the merger. 'It would mean less focus on managing collaborative research programmes and a stronger emphasis on strategic activities,' an ESF spokesperson told Chemistry World. It is clear that this vote represents a major setback for the merger plans. In January 2011, Marja Makarow, chief executive of the ESF, wrote that 'democracy takes time... but change is on the way - retaining the status quo is not an option'. The outcome of the ESF vote has taken both organisations by surprise and they are unclear if, or how, to proceed.